When two people join their money together, it can double their trouble. We surveyed 1,006 couples to find out how they share household costs. In 2017, it was reported that almost one-third of American adults were not living alone, a number higher than ever before. Many are choosing cohabitation with relatives or significant others to offset high living expenses. In cities with extremely high costs of living, such as New York City and Seattle, that number is only likely to continue to rise. In the eighties and nineties, about 25% of income went to rent, but today, the median rent is about 29% of Americans' income. This increase could partially account for why more people are turning to cohabitation. But when living together as a couple, a ton of shared costs need navigating: rent, utilities, cable, and so much more. So how do modern couples divvy up these bills? Is it always as simple as a 50-50 split? Which party in the relationship tends to take control of both the budgeting and big purchase decisions? For decades now, women have increasingly taken up leading roles in the workplace, but experts have reported that more and more women are also taking the lead in the financial realm. 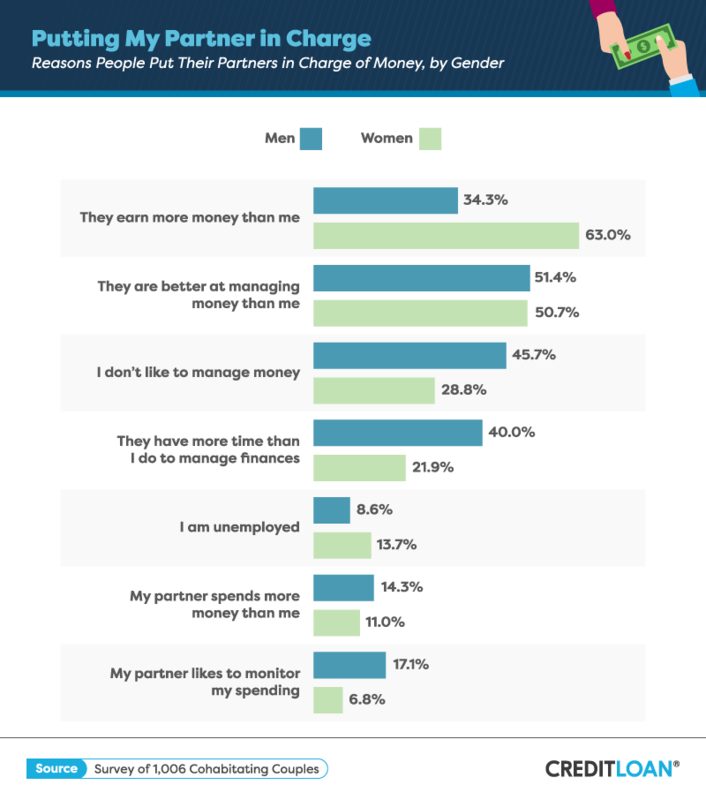 But, as our recent study found, gender is not always the deciding factor when it comes to choosing who will take the budgeting reins and how costs are shared between partners. 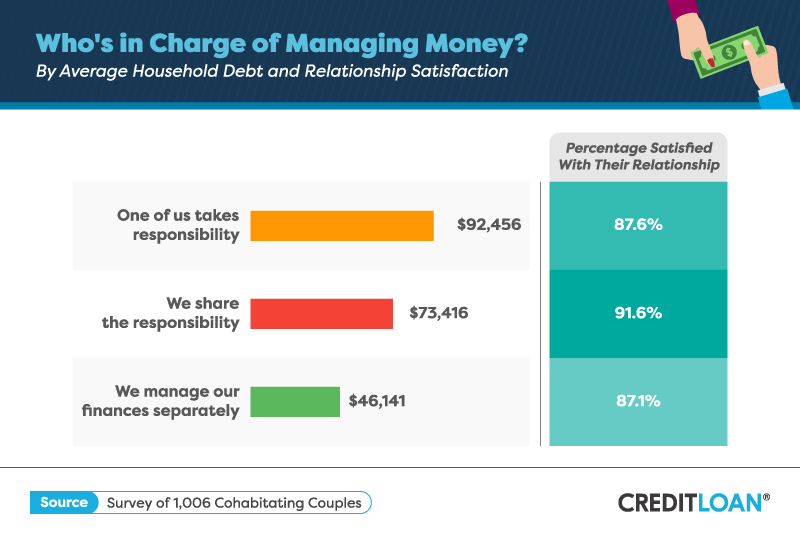 We surveyed 1,006 cohabitating couples and found quite a bit about how people are navigating their personal finances with their significant others. 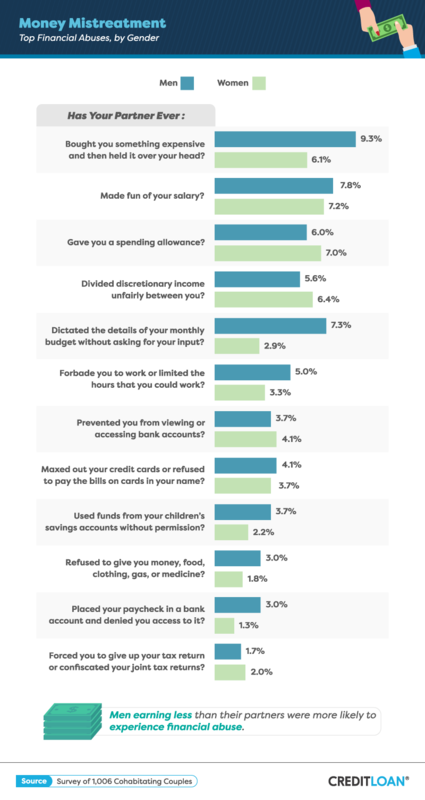 So what are the most popular ways people tend to handle budgeting and spending in a shared household? Read on to find out. Once couples take that big step and sign a lease or buy a home together, they also have to determine the best way to divide their shared costs – regardless of whether they share any financial accounts. Explicitly shared costs – such as the rent or mortgage, utilities, or internet – might seem easy to split down the middle. But how do you divide up costs such as credit card bills? Groceries and dining out? What about gifts and individual spending? 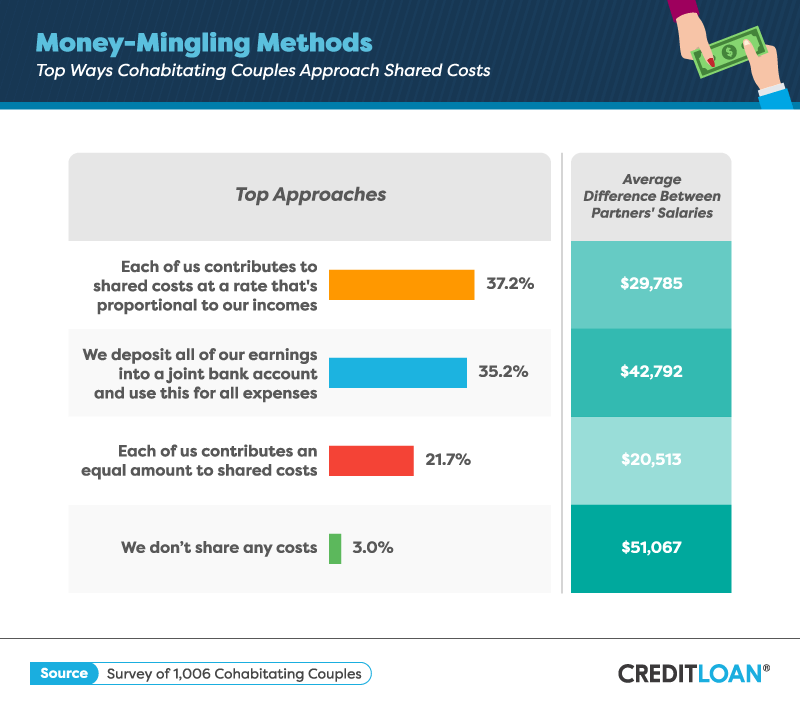 The couples surveyed were most likely to follow two main methods of splitting costs: either proportionally splitting costs based on each person's income or tossing all their money into a joint bank account used to cover expenses. In a proportional split, each person's contribution is equal to the percentage of the total household wealth that they create. For instance, if one partner makes 75% of the household income, they would be responsible for 75% of the household costs. Many see a proportional split as the fairest way to ensure no one person's costs are too high or low in relation to their total income. On the other hand, the main benefit of a joint bank account is that it truly represents shared costs. This method was more popular among respondents who had a larger difference in income levels than those who chose the proportional method. The nearly 22% of couples who split costs evenly had the lowest disparity between each partner's income. Couples who opt for this method tend to be younger, unmarried, and without children. With similar salaries, their contributions to the shared budget are more alike. About 94% of the couples employed one of these three methods to navigate their joint bills. If you're in a relationship, it might be worth the discussion with your partner to see what you could do to change up your approach to costs in a way that's most fair for each of you. 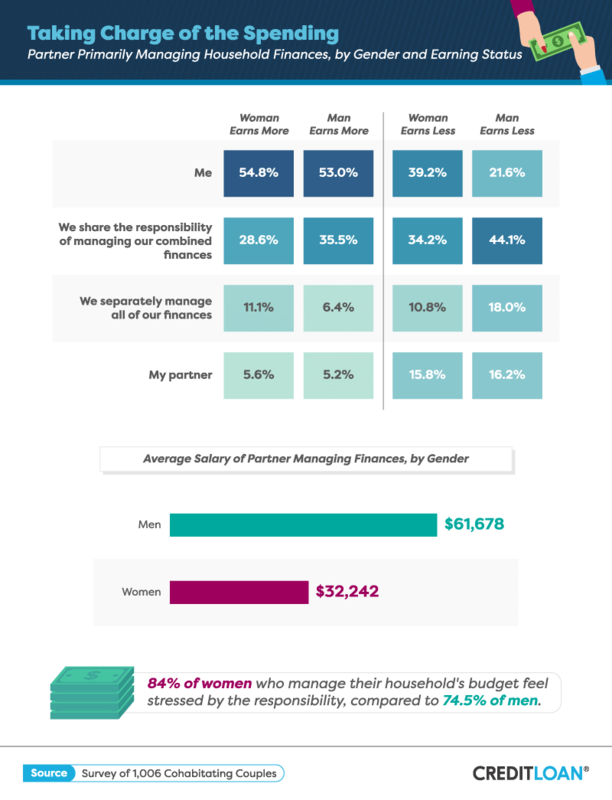 When we looked at the financial habits of women and men, we noticed distinct similarities and differences in the ways they spent, saved, and budgeted their earnings. This translates to a distinction between what types of spending each partner is responsible for deciding on. Partners were more likely to be equally invested in shared or recreational purchases. Luxurious, nonessential buys, such as entertainment and vacations, were most likely to be approached with a team-effort mentality. Fun and frivolous expenses like these are not related to the more mundane task of planning consistent spending such as household costs. Planning a vacation or establishing a savings plan for that new TV may peak the interest of both partners. Shared purchases require both partners to be involved, and housing was a perfect example in our survey results.Buying a home is a very detailed and rigorous process.Respondents agreed the burden of planning a purchase of this magnitude couldn't fall on just one person. Some decisions, however, were more likely to fall on one partner based solely on gender. Women were more likely than men to take the lead on household decor, children's items, and food spending. Only about 3% of men made the final call on home decor, while about 30% of women called the shots in this category. Men, on the other hand, were more likely to report making the final decision on money-related matters: Nearly 20% of men were in sole control of investment spending, while under 9% of women handled it. About a quarter of American men feel prepared to enter retirement with what they have saved, compared to only 12% of women. A lack of confidence, plus the risk of huge health-related expenses, puts women at a disadvantage regardless of their earning status. These results are evidence of an imbalance in who is investing and saving for retirement, which negatively affects the financial strength of women as a whole. Despite these barriers, women are regarded as extremely competent investors who save more and report higher returns on their investments. 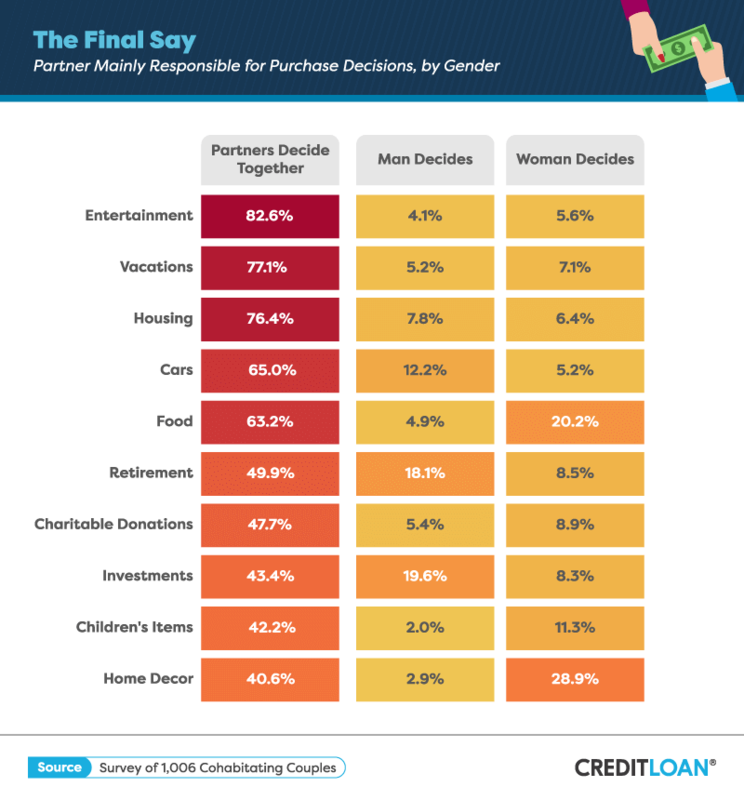 Across the board, both men and women who earned more than their partners reported being the primary decision-maker for the household budget. Sharing the duty was a popular option as well. Over a quarter of women who earned more than their partners and a third of women who earned less split the job with a partner. Sharing the responsibility was reported more often by male participants, regardless of their earning status compared to their partners. Women who managed household finances earned an average salary of over $32,000 per year, while men handling finances at home earned nearly double that amount. Women may earn less on average than men, but they still have great stakes in how the household budgets are managed and formed. Even when men earn more than their partners, they are more likely to share responsibility handling the budget. Yet, as women are more likely to manage the finances in the home, they also find themselves less confident in how much they really know about finances and investments. It's completely natural to feel some level of stress when thinking about your finances. However, a staggering 84% of female respondents and nearly 75% of men respondents reported feeling stress about the responsibility of budgeting. Women are set to control two-thirds of all private wealth in just three years, which makes financial confidence and competence even more important. These high percentages of people who become anxious when dealing with their money speak to the personal financial crisis that the vast majority of Americans face every day. This might mean there's no time like the present to start getting serious about taking financial control. A happy couple is one who works together. In the case of household finances, this statement holds true. People who shared the responsibility of managing finances with their partner reported being the most satisfied with their relationship. When both partners work together and regularly discuss their finances, there is a better opportunity for them to be prepared for the future. This open line of communication is great for their relationship and bank accounts. In houses with more household debt, couples were likely to surrender financial responsibility to one person, while in households where finances were completely split, debt tended to be lower. When both people in a relationship take an active role in their separate and collective household responsibilities, such as finances, they may be more empowered to tackle debt and difficulties. The experience of proper financial planning can be rewarding, but let's face it: Some people can't stand it. The thought of balancing a checkbook might give others nightmares. As a result, they pass on the budgeting duties to their partner for a variety of reasons. While it might seem terrible, learning your own strengths and weaknesses when it comes to money management can help you grow in the long run. Men who let their partners handle the household money were likely to do so because they believed their partner was more skilled, had more time, and was more willing to do it. Women tended to hand off responsibility because their partners earned more. However, new jobs, life changes, and children can all change the dynamic in the home, and couples must be prepared and ready to adapt to the current way of doing things based on what happens in the future. Trust is a huge factor when it comes to combining finances with a partner. Looking into another person's spending habits and income can be incredibly intimate – but money conversations, however difficult, are key for relationship success and can deepen trust. However, our survey results indicate some couples may be lacking in trust: Roughly 17% of men and nearly 7% of women reported giving up control of the finances because their partners preferred to monitor their spending. Methods of control such as monitoring spending habits can manifest into something more nefarious if an individual has bad intentions. They can easily use guilt or anger to manipulate their partners and cross major financial boundaries. When couples engage in an open discussion about how to properly spend their combined earnings, each person can express his or her opinions in a productive way. Unfortunately, when those conversations are consumed by hurtful or controlling language or avoided entirely, things can turn ugly. There are many types of financial or economic abuse, ranging from verbal (degrading your career or salary shaming), emotional (secrecy over account balances or tax returns), and harm to someone's credit (maxing out credit cards with no intention of paying the balance). Although the frequency of these occurrences isn't very high overall, a significant number of participants in our study still reported experiencing one of these abuses from a partner. In America, a man faces aggression from a partner every 38 seconds, and the stigma surrounding men who are abused makes it harder for them to get help. Often, this abuse manifests itself in non-physical ways by partners who are possessive and controlling. Our data showed men earning less than their partners were more likely to fall victim to money-related abuse. In fact, across the board, men were more likely to face challenges related to this type of mistreatment. In eight of the 12 questions related to financial abuse, male respondents were more likely to answer "yes" than women. Experts suggest learning the warning signs of financial abuse. One of the key ways of avoiding financial abuse is having knowledge about joint accounts and assets. By having regular conversations with your partner, you can build trust and ensure you both are fully informed about where you stand with your joint finances. Knowing the signs can also help you see potential pitfalls in your own relationship or that of a friend before they get out of control. Open communication is crucial to not only being financially successful with your partner but also to prevent anyone from taking advantage of anyone else. There are many ways to divvy up household spending and bills, so experiment with multiple methods until you find one that works best for you and your situation. There are even apps that can help bridge the gap and make the experience a little easier. Relationships are all about balance and compromise, and finances fall right in the middle. Sometimes it takes a few serious discussions to find common ground about the techniques you will use to budget your joint incomes. Take your time, and figure out which options are best for your lifestyle and your love life. We collected 1,006 survey responses using Amazon's Mechanical Turk. Participants were Americans who were either engaged, in a relationship of three months or longer, or married. All participants were currently living with their partners. 6.6% were engaged, 33.8% were in a relationship of three months or longer, and 59.6% were married. 46% of participants were men, and 54% were women. 93.9% of women had male partners, while 6.1% had female partners. 96.7% of men had female partners, and 3.0% had male partners. Less than 1% had a nonbinary partner. Participants ranged in age from 18 to 74, with a mean of 37.3 and a standard deviation of 11.0. No statistical testing or weighting was performed, so the claims listed above are based on means alone. As such, this content is purely exploratory, and future research should approach this topic more rigorously. To simplify these visualizations, responses of "other" were not included and comprised a small number of overall responses. If you found this relationship information helpful, please feel free to share it with your friends – or maybe even your significant other – for noncommercial purposes. We just ask that you cite CreditLoan as the source of this material.